Rafael Velasco ’19 spent his summer at Army ROTC in Fort Knox, Kentucky, running drills in sweltering heat with a 55 lb. ruck on his back—barely getting by on four hours of sleep. At least two of his classmates were not impressed. “Four [hours]! Were you on vacation? It was two for us!” said Lindsay Burton ’19, as Hunter LePla ’19 grinned in agreement. The three CMC seniors are completing their fourth year as Army ROTC cadets. They are part of a CMC tradition that predates the College. This year, the ROTC program celebrates its 100th anniversary, making it one of the oldest in the nation. 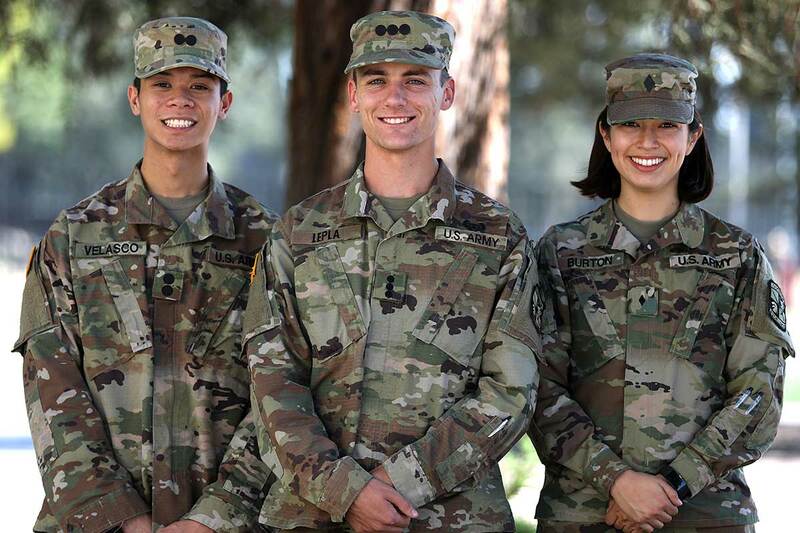 Kidding aside, Velasco, Burton, and LePla, who serve as CMC’s three senior officers in the Golden Lions Army ROTC battalion based on campus, say their cadet experience has been a transformative part of their education. CMC’s shared ROTC history on campus creates a unique intergenerational thread for cadets. Military training began in 1916 at Pomona College and the infantry ROTC unit was officially authorized by the U.S. war department in 1918 (the framed Western Union telegram notifying Pomona hangs in the ROTC office in Bauer Center South). Claremont Men’s College joined Pomona in 1949 as a co-host. In 1995, CMC assumed full responsibility for the program. There are currently 16 CMC cadets. Together with roughly 150 others from California Poly Pomona, Azusa Pacific, California State San Bernardino, California Baptist, and UC Riverside, the Golden Lions are one of the biggest ROTC programs west of Texas, Doyle said. Cadets spend 12 to 15 hours a week with ROTC, starting with physical training in the mornings and lab/classroom work on Fridays. The goal is to find balance in both military life and civilian life while on campus. While ROTC students have different schedule considerations—be it working on projects weeks in advance because of Camp Pendleton training or knowing how to plan summers around a month-long Advanced Camp in Fort Knox—their military commitment should not stifle the “regular student” experience at CMC, said Lt. Col. Michael Doyle, Professor and Chair of the Department of Military Science and Leadership. In fact, their ROTC learning should enhance it. Doyle believes CMC’s liberal arts program is excellent preparation for today’s military leaders. Among the characteristics he values most from CMC cadets: critical thinking, adaptability, problem solving, interpersonal communication, and ethical leadership. Indeed, CMC’s senior officers find their time in ROTC complements and supplements their other interests. Velasco, a Neuroscience major, is a Diversity and Inclusion Fellow at the CARE Center and has his own social media start-up for small businesses called SocialSpur. He also founded a group for first-generation college students, 1Gen, in which Burton is also active. Burton, a dual major in Government and Middle Eastern Studies, is a research assistant at the Rose Institute. She speaks Arabic and has lived in Jordan and Morocco. LePla is an Economics major who speaks multiple languages and has been trained at Air Assault School in Fort Hood, Texas. The trio is proudly carrying the ROTC torch for the College. And though they are several months away from graduation, big plans are forming. In the spirit of liberal arts, all three are set to take different paths as Army Second Lieutenants (2LTs): Velasco is headed to the Army Reserves to serve in the Quartermaster Corps (handling supply and logistics), Burton to active duty in military intelligence, and LePla to active duty as a helicopter pilot. A lot could change in the year ahead, most likely at the military’s discretion. But wherever they end up, LePla is confident that the partnership between ROTC and CMC will have prepared them for success. “You come here fresh out of high school, no exposure to college or the military, and it’s a scary prospect. But you learn discipline. You learn time management. You keep doing your work and eventually this whole host of values becomes part of how you think and operate,” LePla said.